As an event planner organizing an upcoming convention or conference, you may be considering giving back to your host city’s local community as a gesture of good will and social responsibility. If your next event is in Québec City, make sure you check out these worthwhile local causes that you and your sponsors and event attendees can give back to! Pignon Bleu, with its headquarters in downtown Québec City, helps local families and children who live near or under the poverty line. It prepares nutritional snacks and meals for low-income families and schools in underprivileged neighbourhoods. Pignon Bleu also organizes socio-educational activities to help children succeed at school and support their growth. It also fosters social inclusion for people looking to enter Québec’s workforce. Moisson Québec is one of Québec City’s main food banks. With its network of 18 partner organizations, it collects food donations from citizens, restaurants, companies and institutions, and redistributes food to families in need and helps to eliminate food waste. 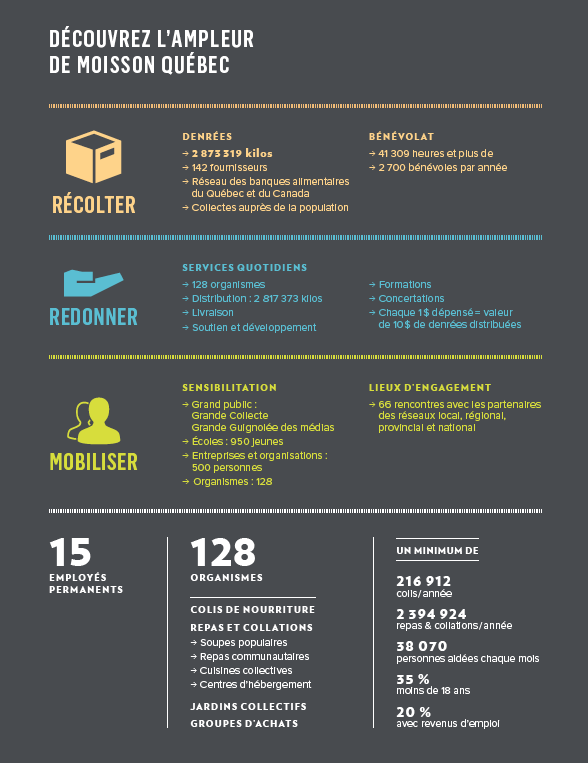 On average, Moisson Québec provides 2 394 924 meals/snacks per year and helps nearly 40 000 people. The Québec chapter of the Canadian Red Cross offers a wide range of programs and services for the city’s local communities, including emergency and disaster services, water safety and swimming lessons, violence, bullying and abuse prevention, and much more. Volunteering opportunities are updated regularly; however, corporate donations and fundraising options are also available. Lauberivère offers a wide range of services to help homeless women and men and people in need, including a soup kitchen, emergency accommodations, day centre activities and psychological support. Founded in 1983 and open 24/7 365 days a year, this Québec City organization has helped thousands of local citizens. They always need volunteers to help welcome them. Events offer great opportunities to raise awareness about local issues, and incite attendees and sponsors to get involved. When planning an event, try to add a touch of social responsibility; you’ll see, event management will have never felt so good!